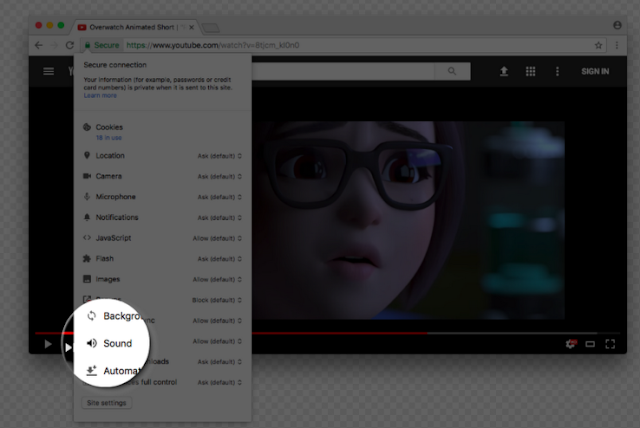 If you've ever had to put up with unnecessary bandwidth consumption with auto-playback sounds, then you have something to rejoice about, as Google is currently testing a new feature in Chrome browser that will allow you to mute a website. While Google introduced an indicator to flag culpable sites some years ago, now the Chrome team is testing mute option in the latest experimental "Canary build". The mute feature would only be available in Chrome browser, that is if it sees the light of the day through testing, which effectively makes it a sound block, and perhaps make the feature a possible contender for other browsers. It invariably adds desktop UI that uses the sound content setting to mute and unmute Websites. If you want to give it a try, simply click on the security status on the left of the website address, and then the option to mute the site can be found in the list of details and permissions. As the mute is hidden behind a flag, it probably lasts until the settings has been updated which makes it a temporary block.